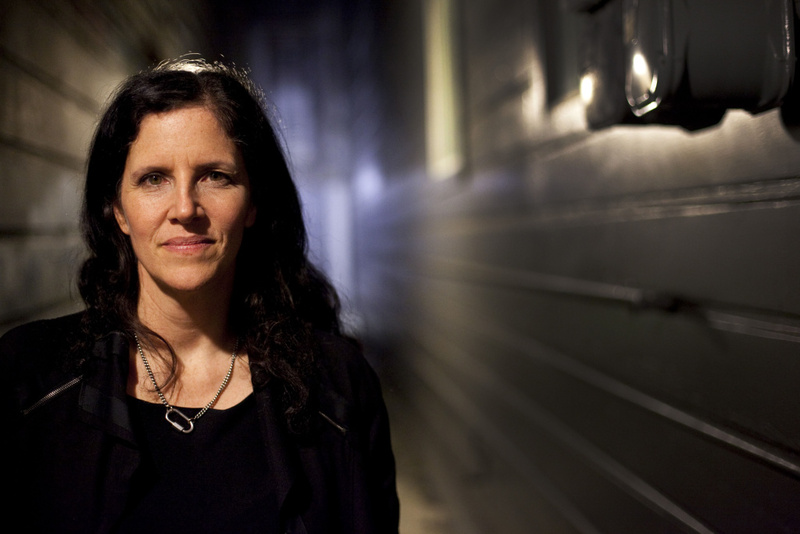 Documentary filmmaker Laura Poitras at the premier of her film "Citizenfour" about Edward Snowdon, in San Francisco, October 21, 2014. 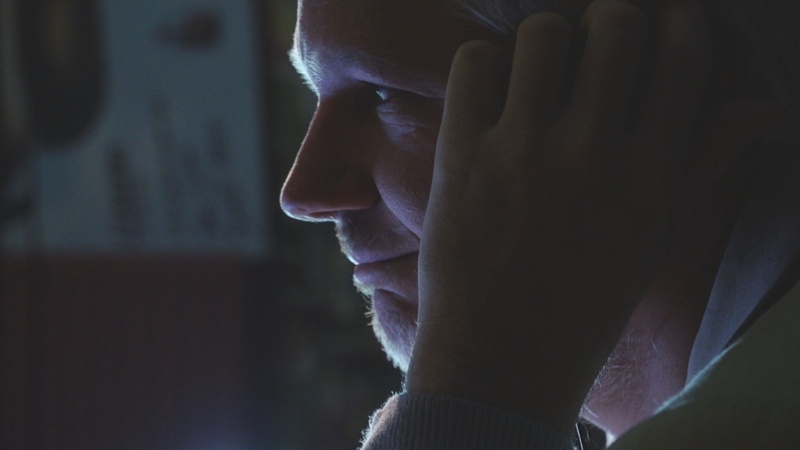 In the documentary "Risk" Laura Poitras, who won an Academy Award for the 2014 film "Citizenfour," reveals a complicated portrait of Julian Assange. The Wikileaks founder is hero to some, enemy to others but, to Poitras, he's a man full of contradictions. To grapple with some of those, at various points in the movie she includes voiceover of herself reading excerpts from a production journal she kept during the six years it took to make the movie. The result creates a tense portrait of what it's like to be in on the inner circle of the Wikileaks founder as he does things like call Hillary Clinton, don a disguise to flee from the UK authorities and rant about the women who accused him of sexual assault. Poitras added the journal excerpts after the film first screened in May 2016 at the Cannes Film Festival. After that screening she went back into production to include, among other things, the 2016 presidential election. In fact, she was adding pieces to "Risk" as recently as a week ago when the Justice Department stated that it was making the arrest of Assange a high priority. When she came to The Frame studios at KPCC, Poitras opened up with host John Horn about how boundaries got blurred and how the film became a look at gender dynamics and abuse of power which complicated, and contradicted, some of what she originally set out to document. Below are excerpts from the conversation. To hear the interview click the blue play button at the top of this page. When I began filming, I approached it much more as an observer and things shifted when I was contacted by Edward Snowden, first anonymously and then meeting him. Then somehow I was pulled in more as a participant around these issues so it kind of transitioned. During the filming and in the film, I use my note taking production journals. When I'm shooting, I often write down thoughts of what's going on and what's happening in my head in terms of following the story. Those are included so it's more subjective than my previous films. I think this film that tries to hold some contradictory ideas. 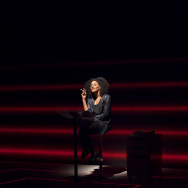 It was a way for the audience to help navigate those and to share my conflicting feelings as I was shooting so that the audience, in a sense, has permission to feel those contradictions as well. So it was a device to do that and also a way to be transparent with the audience. That I felt I needed to talk about my position in this story. "With this film, the lines have become very blurred. Sometimes I can't believe what Julian allows me to film. Ego, yes. But also brave. He's managing his image, but also being vulnerable. It's a mystery to me why he trusts me because I don't think he likes me." As a filmmaker, you're in a position of being trusted. It's a privileged position that you're being let in. There were plenty of times when he was really nervous. The stakes were high. It wasn't just about him wanting to be on camera. For instance, when he was calling the state department to talk about the fact that the state department cables were about to come out unredacted, he was shaking. 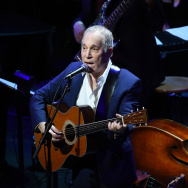 I could hear his heartbeat in my microphone. I had no idea. This was one of those moments that Julian wasn't going to tell me what he was planning. There were people in the organization in Wikileaks who didn't know that he was planning to seek asylum. I got into the car that morning thinking fully well that I was going to film at the court and then we stopped at the hotel and then I went into the room and realized he was changing appearance and you can see everyone is whispering. So it's not like anyone told me what was going on. I had to deduce it. That's Julian being super protective. Then I'd filmed that and didn't know who knew that he was going to be seeking asylum so I couldn't even talk to other people in the organization. I thought, I had this information and I'll make it public when the time is right. So it was a complete surprise to me. In 2010 allegations came forward in Sweden relating to sexual offenses. Sweden was seeking to have him extradited to Sweden to answer questions. The things to know is that there haven't been charges filed yet and this is six years later. But they did want him to go to Sweden and he resisted. His lawyers felt that if he were to enter into custody into Sweden that the U.S. would then use that opportunity to issue an extradition and have him extradited to the U.S. in relationship to his publishing. It's a theme in the film that is trying to look at how gender politics play out in the organization and hoping that resonates more broadly, culturally, to address these issues. For me, as a filmmaker, I want to occupy this complexity. I support Wikileaks' right to publish and I think it's frightening that they're being threatened currently by our government. And yet, I don't want to excuse behavior that is derogatory or abusive towards women. "This is not the film I thought I was making. I thought I could ignore the contradiction. I thought they were not part of the story. I was so wrong. They're becoming the story." [The journal entries] were a way to help the audience understand that there are contradictory things and to have insight into them. When I started filming with Julian and Wikileaks, I went there with the intention to film journalism — their journalism and its impact on the world. But when I got there, they were focusing most of their energy on this legal fight against extradition to Sweden and his political asylum. The story shifted in that direction and so I had to follow that. I didn't really set out to make a film about gender politics and sexual offense allegations. That was not the film I set out to make, but they became themes in the film. 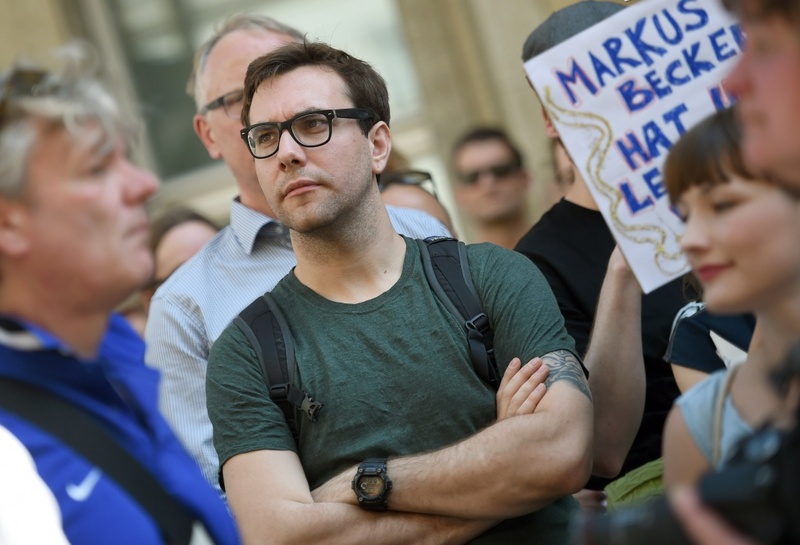 US journalist and internet activist Jacob Appelbaum attends a demonstration in support of freedom of press on August 1, 2015, in Berlin. In Wikileaks, there's a small staff that are paid and then there's a larger organization of volunteers and supporters that also do work with them. He's one of those. I'm really interested in how Wikileaks and how the internet changed politics. Certain things emerged that were possible with the internet. Wikileaks is part of that narrative. So he was one of the protagonists. But as I referenced earlier, after I screened the film at Cannes, new allegations came forward that involved him. I knew at that moment that I had to address this in the film, that a second person in the film was being accused of abuse and that I had to take that on. We have to say that everything are allegations at this point. The meeting was at a hacker conference. It was asking these questions that I think are really important questions like, how is abusive behavior enabled? How is it covered up? So there was a processing going on there. And I felt it was important to disclose my involvement with him for transparency and also because I had a direct knowledge. I had an obligation to do both of those things. Let's be honest, we just elected a president who self-proclaimed pretty predatory behavior and people felt it was okay to vote for him. I don't quite understand that, which doesn't mean that I'm any kind of a fan of Hillary Clinton, because I'm not. But I do think that there are questions around male power abuse that we should be grappling with. I mean, look at Fox News. So the film is trying to get at those things, not at the alleged crimes, but the attitudes around gender. And to bring them forward and say, if we're going to have political movements let's have political movements that internally are based on social justice and equality. So I that's one of the conversations that comes out of it and I hope that men take the lead in that conversation. The quotes were — I'd shown him a version of the film, which was the version that screened at Cannes — that the film was a sever threat to his freedom and he's forced to treat it accordingly. What he meant by that, only he can answer. He did ask and put pressure on me to remove certain scenes from the film that include him speaking about the Swedish case and I didn't do that. So I think that's what he's upset about. Personally, I don't think that I'm endangering him. Which doesn't mean that he isn't in danger. I think he's in danger. But he's in danger because he's angered a lot of people and because of his publishing. That danger is real, but I don't think that my film adding to his risk. Hopefully it's a really complex portrait. He also presents this philosophy in the film about why he does what he does. Julian is a really historically important person. He understood how the internet was going to transform politics, power and journalism. I'm interested in a portrait about that and his thinking. He's also a very flawed individual and that's also part of the film. I'm interested in both of those elements. I think the mainstream coverage is usually so one dimensional and hopefully the film gives it a really different insight, both in his ideology but in his flaws and weaknesses. Julian is engaging in journalism that has had global repercussions and many of them quite positive. He's broken some important stories. Then you also have this small group of people who can have so much influence because of shifting technology and the internet. I was so interested in that reference to the game Risk, but then also the fact that everybody in the film is at risk and how the heightened risk then leads to complex shifting alliances, power dynamics, betrayals, trust and lack of trust.